Note: This blog post is superseded by our 2017 blog post on Docker, which covers best deployment practices with Docker swarm mode. Containers are changing the way applications are architected and deployed. Whether you are using a service or microservice-like architecture, your application still needs the persistence provided by a Database. So how do you architect and orchestrate your deployment when existing database solutions are inflexible or require manual configuration to set up and run? Enter Aerospike, with its shared-nothing architecture, Smart Clients (™) and integration with the Docker ecosystem that enables automated scaling up and down and self-healing of the persistence layer, and integrates with Compose, Swarm and other key Docker technologies. But first, let’s take a step back. Encapsulate the dependencies for the process you want to run, e.g., the packages required, the frameworks that need to be present, the code you want to execute, etc. Application architectures are also evolving, especially with the adoption of microservice-like architectures. Your application is no longer one humongous, static binary or set of packages; it starts to look like a series of discrete services that are brought together dynamically at runtime. This is a natural fit for Containers. But how does this mesh with services that require persistence or require long running processes? Shared-nothing architecture: there is no reliance on a single node for configuration, state management, etc. Nice Theory, But Show Me the Money! The code examples below can be found in this Github repository along with the Compose files, etc. 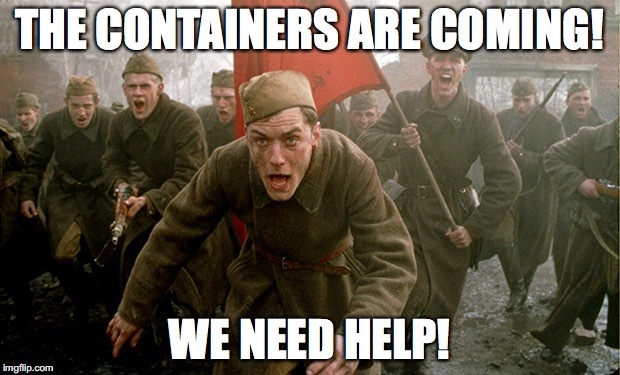 We will create three new Docker Hosts. One will be used for Service Discovery by the Docker’s networking systems (blog-consul), and the other two will be used to run the Aerospike processes (blog-0 and blog-1). We will create the multi-host network prod which will attach the Aerospike nodes. Let’s look at those service definitions in detail. command: "--swarm-url=$DOCKER_HOST --swarm-tls-ca-cert=/etc/docker/ca.pem --swarm-tls-cert=/etc/docker/server.pem --swarm-tls-key=/etc/docker/server-key.pem --debug --plugin aerospike start"
A declaration to use the network bridge. This ensures that the discovery process can connect to the Swarm cluster to receive Container events. The discovery service initially joins the bridge network so that it can receive container start and stop events from the Swarm cluster using the Docker Remote API. But it also needs to join the prod network in order to send configuration messages to the Aerospike nodes provisioned on that network. 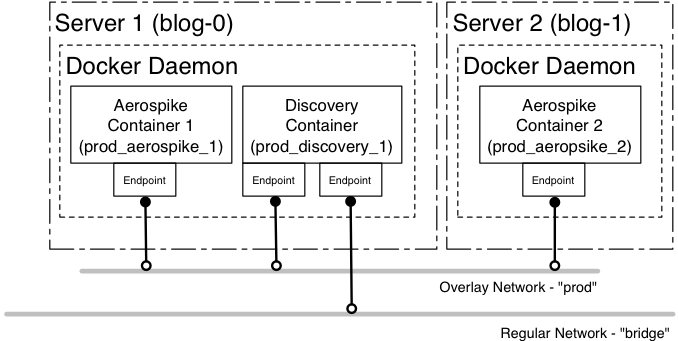 Using the network command, we can add the discovery container to the prod network. We can now use aql tool to log onto the Aerospike server and create some data. We are going to run aql in a container as well. The hostname blog_aerospike_1 comes from the name of the container. Docker Compose combines the project name (by default, the directory name) with the service name and an incrementing integer to ensure the name is unique. With multi-host networking, these hostnames can be considered concrete, so it’s simple to build scripts relying on these names. The same script can then be used across multiple deployments of the same Compose file. The hostname will be the same; each network will simply provide a different IP address based on the network settings. This enables multiple developers to deploy the same set of Containers and run the same scripts in development, testing or production environments. In order to control which Aerospike cluster the new Aerospike container should join, the plug-in compares the value of AEROSPIKE_CLUSTER_NAME with the value of the label com.aerospike.cluster from the container. If there is a match, then the AEROSPIKE_NETWORK_NAME is used to obtain the IP address information from the correct network so that the existing nodes can be contacted and informed of the new node. Clearly, as you start and stop Aerospike containers, the resulting changes in cluster topology will be reflected by the output of this command. Docker makes the orchestration of complex services simple and repeatable. Aerospike is Docker’s natural complement as the persistent store for the application you build and deploy with Docker. It is well-suited to Container deployments, and its shared-nothing architecture makes deploying and responding to changes in the container topology simple. Aerospike is focused on Speed at Scale. This means that Aerospike is not just great to start with; it will also scale seamlessly as your application grows.